elcome to my Asatru Page. 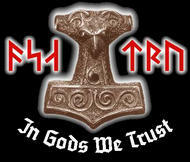 On this page you will find links to all the Asatru Information I have gathered so far. Some was written by me and others who gave me permission to either copy or link to their info. My Pagan Path forked drastically a few years back and now find myself a follower of Asatru. This does involve alot of studying including Futhark Runes, Eddas, Sagas and doing other work. Instead of a table of content you will now find the list under each page. Enjoy these links and let me know if you have more info to add.